SOAPware DocumentationSOAPware FAQ'sFAQ's Summary/SOAPnote SpecificQ: How do I enter "Electronically Signed By" into my SOAP Note? A: The shortcut "esb" will need to be uploaded to your local library so that it may be inserted into the SOAP Note Follow Up field. This code insertion can be done automatically when entered in the Provider Manager/Codes Tab. 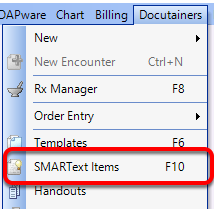 Open SMARText Items Manager by using the F10 key located on the keyboard, or go to Docutainers > SMARText Items. 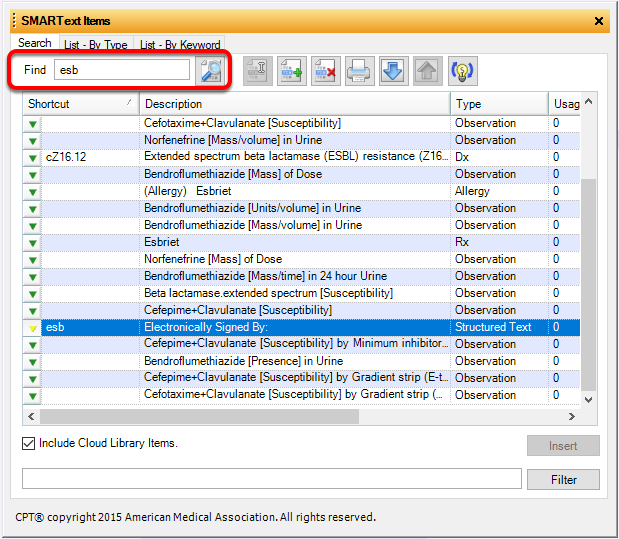 From within SMARText Items Manager, enter "esb" in the "Find" window and click the Search button. Click to highlight the item for "Electronically Signed," and Click on the download button to download this item to your local library. After this item has been successfully downloaded to your local database/library, go to Tools > Provider Manager to enter this shortcut in the Codes tab to be automatically inserted into the SOAP Notes Follow Up field. Click to highlight the preferred provider in list to add shortcut code. Click on the Codes tab. Insert the shortcut "esb" in the Default Follow Up field. Previous Lesson: Q: How can a patients past visits be viewed while also viewing the current encounter? Next Lesson: Q: I renewed my support agreement but still get a pop up asking me to renew.